The 2015 Kansas Legislative Session begins January 12 and speculation abounds about the course to be followed for the state. The November elections confirmed that while the majority of Kansans elected Republican legislators with a Conservative leaning, the Northeast Johnson county electorate still supports a more moderate viewpoint. But the majority rules in the political world; thus, the challenges we face including a revenue deficit of over $700 million dollars from our current state budget will be dealt with by that majority. What to expect is clearly anyone’s guess. As District 21 Representative I have been assigned to the Health and Human Services committee, the Education Budget committee, and Vision 2020. One of my vocal concerns for the state is the need to expand Medicaid, providing insurance coverage for approximately 182,000 working-poor Kansans. The state loses millions of dollars of federal funding by not expanding, hurting individuals as well as hospitals. The new head of the House Health committee is opposed to expansion, so I do not expect a bill to move through committee. I am also supporting a bill to require adding background checks for gun purchases made on-line or at gun shows. Health statistics for states that have added this law are significantly improved. For my first three years in the legislature I was a member of the Vision 2020 committee and now return. The purpose of this committee is to bring forward key issues that need to be addressed by the legislature in the near future. Past work that is now under legislative consideration include a 50 year water plan for the state, accessible broadband for all parts of the state, and work to reduce the number of higher education students requiring remedial classes upon entering college. Very few states take the time to plan ahead, and it is exciting to see Kansas move forward on ideas recommended by this committee. Education Budget is a new committee for me. With no other Northeast Johnson County legislator on an Education committee, the responsibility to enhance or at least maintain funding for our public schools weighs heavily on my mind as the session begins. With three years under my belt on the regular Education committee, my understanding of the funding formula is solid and my commitment to the education of our students unwavering. Over half of the State General Fund money is budgeted through this committee, so the task ahead in light of the state’s diminished revenues will be critical. You will be hearing from me every fifth week on shawneemissionpost.com. I regularly write an e-newsletter that you can request from [email protected] or by reading it at my website, barbarabollier.org. 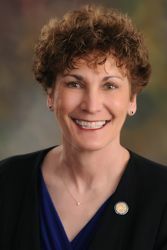 You can also connect through my Representative Barbara Bollier Facebook Page where I post articles about what is happening in the legislature on nearly a daily basis. I look forward to the opportunity to serve you in the months ahead!